Overview Remember Me When is written and illustrated by kids and part of Reflections Publishing's "Kids Helping Kids Through Books" series. Remember Me When specifically addresses the emotions that children experience when they are navigating through Alzheimer's disease with a loved one. The fiction stories in this series are written and illustrated from the fresh perspective of kids. With the stories written by child authors, child readers who are going through a difficult time can read these stories and have their feelings validated. By connecting with the children through a fiction story, it simply provides a start for the healing process. Because true healing requires a broad focus on emotional, educational, social, and even spiritual needs, this series also provides a non-fiction section for children (and parents) with the tools they need to navigate through these situations. Specifically, at the back of each book in this series, readers will find commentaries for dealing with difficult situations from experts in various fields (e.g., child psychologists, educators, therapists, and religious scholars). We believe this series will provide children with valuable tools to assist them in dealing with many real-life challenges. Description of Remember Me When: The cruel reality of Alzheimer's disease is that it steals from two groups of people. Individuals suffering from this form of dementia are callously robbed of their minds and memories over time. Just as heartbreaking, though, is the theft of the continued comfort and joy the Alzheimer's patients would have brought to their family members and loved ones as the disease progressively grows worse. 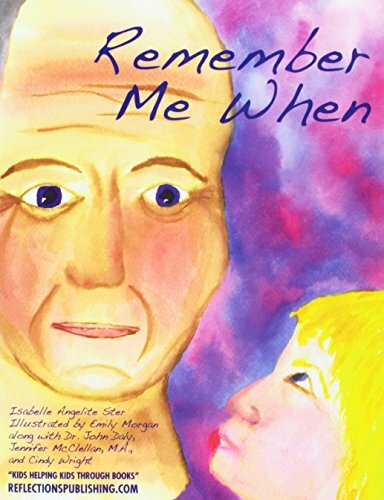 Remember Me When is a heartfelt story that provides insight into the terrible crime that is Alzheimer's disease, as told from the perspective of an unlikely collateral victim-a child. Combining a touching story written by 8-year-old Isabelle Ster (whose grandfather, Papa Jerry, suffers from the disease), beautiful imagery from artist Emily Morgan, and expert advice on coping skills and interacting with those who suffer from this disease, Remember Me When will be a cherished resource to families and friends as they journey alongside a loved one with Alzheimer's disease.